it takes more than just a pretty voice to be an acoustic goddess these days. here's what camille uses to create her own unique sound. camille's main road guitar is a beautiful custom breedlove that she acquired in 1999. talk about mojo-this instrument's got it. similar to a martin ooo in size, this guitar is made of striped ebony with a sitka spruce top and wood binding. it sports the trademark breedlove split lightning bolt bridge and asymmetrical headstock. tres cool. inside, camille equipped it with a fishman rare earth blender system. ok, so what about the mojo? camille was visiting electronics wizard chris grener to get some work done on her martin j-40. chris mentioned that he was looking for a good home for his breedlove. this is the instrument that chris had been using for several years to demonstrate his pick-up systems. the list of musicians who have played this guitar reads like a who's who of the music industry. a few names that come to mind are paul simon, sting and garth brooks. this is also the guitar that camille had borrowed to record "diva's day off." needless to say, camille arrived at chris' house with one guitar and left with two. camille and the breedlove have been inseparable ever since. camille is also excited about a guitar she received last year. 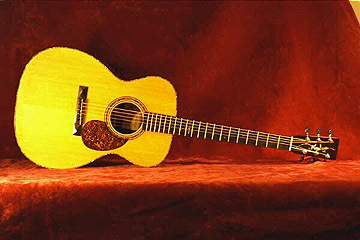 it was custom built to her specifications by luthier steve kovacik of scotia, ny. in addition to creating amazing guitars, steve is a fine player and has been camille�s sideman on some of her solo gigs. 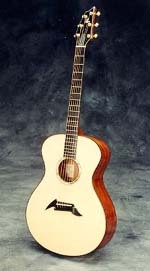 this gave him an intimate knowledge of her guitar style and allowed him to really fine tune the design. the guitar is close in size to a 1930�s era martin ooo with beautiful east indian rosewood back and sides and a sitka spruce top with spectacular bear claw figuring. to stay consistent with the vintage feel of the instrument, steve used tortoise binding (well actually tortoise colored plastic), a 30�s style tortoise pick guard and an ebony pyramid bridge. the top has abalone pearl purfling and a pearl and ebony rosette. best of all, steve inlaid the headstock with a magnificent abalone pearl chameleon (camille�s favorite reptile). camille says, "this guitar sounds every bit as great as it looks and felt comfortable from the moment i picked it up." camille also travels with a 1989 martin j-40. this was her primary road guitar prior to receiving her new kovacik. when playing solo gigs, camille uses the j-40 for open tunings (usually open d). "i was starting to play more in alternate tunings back in �92 or �93 (mostly dadgad and open d), so i decided that i needed a second guitar. i had a 1932 martin o-18 in really bad shape and an old mahogany guild that i thought i could trade for something more suitable for stage. bright and early one saturday, my husband scott, steve kovacik and i loaded up the car and headed off for the vintage fret shop in new hampshire to see what dave coburn had for sale. three hours later we arrived at dave�s to a very disappointing selection. dave had lots of wonderful guitars, but not in the price range we were looking in that day. dejected and depressed, we started home. a few miles down the road, scott remembered another guitar shop he had passed. what the heck, let�s give it a look. at first glance, we didn�t see anything of interest. there were lots of student guitars and cheap electrics, but nothing very good. then steve spotted it. hanging on the wall behind the counter was a beautiful maple and cedar cutaway. it must have had an inch of dust on it. the owner had the guitar tagged at $1300. it had been hanging there for a couple of years, since george morris (who used to run the vermont luthier�s school) traded it for a drum kit his son wanted. the store wasn�t interested in my trade, but sold me this beautiful instrument for $750. such a deal!" camille�s breedlove is equipped with a fishman rare earth blender system. the combination of a magnetic pickup along with an internal mike works extremely well in theaters and larger halls. for smaller venues, camille uses her martin j-40, equipped with custom electronics built by christopher grener. chris's system consists of an internal high frequency microphone, an internal low frequency microphone and a bridge plate sensor. 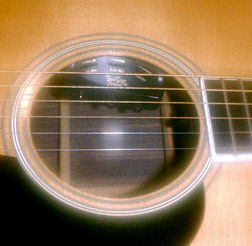 a preamp and control module located under the top edge of the sound hole contains master volume and tone controls as well as separate volume controls for the internal mikes. this allows camille to blend the signal from all three sources with the touch of a finger. the best part of this system is that no modifications whatsoever are made to the guitar. when everything is up and running, it does something that no other acoustic guitar pickup system does-it sounds like an acoustic guitar. in addition, camille sometimes brings along an a tc electronics chorus/flange box. on stage camille uses a sabine stick on tuner.